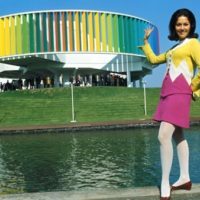 Expo 67, the World’s Fair held in Montreal in 1967, was rather an hallucinogenic affair. Among its memorable features were its wildly innovative audiovisual projections. They were large, bold, and spectacular. In purpose-built pavilions, the Expo’s films boasted dazzling arrays of often-huge screens and novel, captivating forms of viewership. Pavilions immersed viewers within enormous audiovisual environments.